7/19/99--from Chris Miller. - Dear David, Great to see you--and everyone--at the Suzuki Roshi archive meeting at Green Gulch yesterday. Perhaps I can help with the date of Trungpa's visit to Tassajara. I was there most of the time from summer 1970 until April 1972. 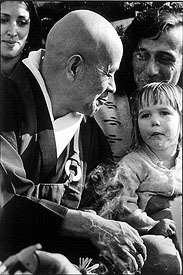 When Trungpa came to Tassajara I was a doan, which means it had to be spring of 1971.